As someone else pointed out earlier with all the success of the Merc 400R and the O/B power cats & CC's why are we not seeing builders using this power on traditional closed bow V-hull boats? There have been a few the Donzi GT and Active Thunder, Outerlimtis SV-29 O/B?? 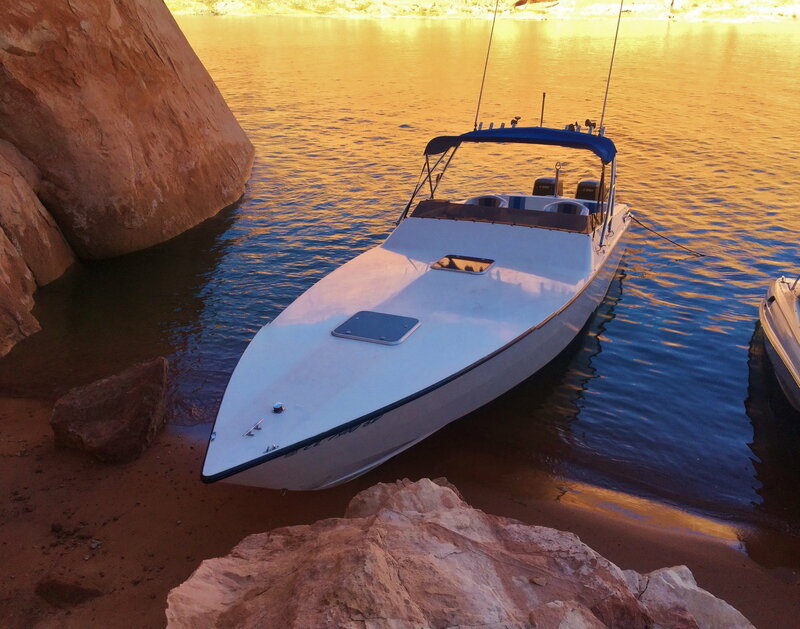 A/T has one in the classifieds and it seems like I read somewhere that Sunsation was working on an O/B 32' closed bow boat or maybe I was dreaming that part. I boat in fresh water now but salt water will be in my future when I retire and I like the idea of a closed bow performance boat with out board power and when I say performance to me that means 70-80 mph I realize that's slow in todays world but obtainable speed with the 400's. Thoughts?? akaboatman and larslindroth like this. Strictly from a longevity point of view, when you enter the world of 'salt" OB's have a far better resistance to it........Ocean boating is great, but "you pay to play" with I/O power. Twin O/B Sonic and HabanaJoe like this. I think the true sport boat type still wants inboards. I know I do! 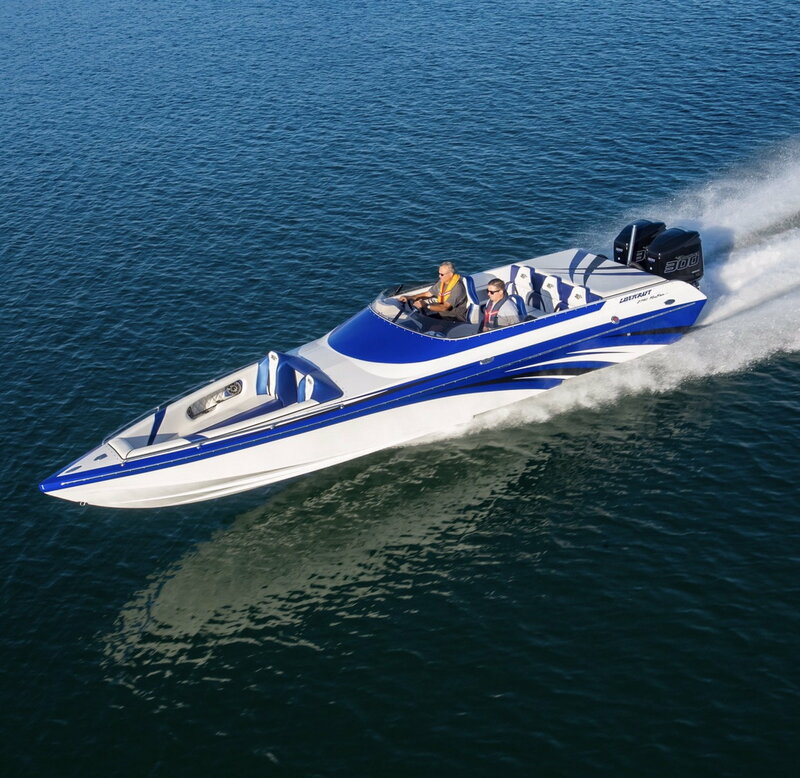 The new 45-Speede model from Adrenaline Powerboats is supposed to be just what You're after. The practical aspects of a Center Console in a cabin performance boat and quad 400R's. "It boasts a state of the art retractable sun-pad that reveals a swim platform, and entertainment area, with speakers, coolers, and a ladder. You won't leave your friends at the dock, with 4 bucket seats and wrap around rear seating for another six." We'll see. This is one of my most eagerly awaited premieres at the Miami show. I was fortunate enough to get hold of legendary offshore racer Pete Rothschild's, by him last ordered Team Scarab, a 1990. His pal Larry Smith custom built it for him with a full equipt cabin, swim step bracket for twin outboards, so he could dive and fish from it. I love the practicality of it since our Pacific Coast most of the year is a little chilly and it provides good protection from the elements when You need it. Easy to get in and out of the water for both leisure and safety. Will upgrade to the next bump on power of the new 300R V8's. Prefer to avoid whining blowers when stepping up from my super reliable but noisy twin 250 two strokes. 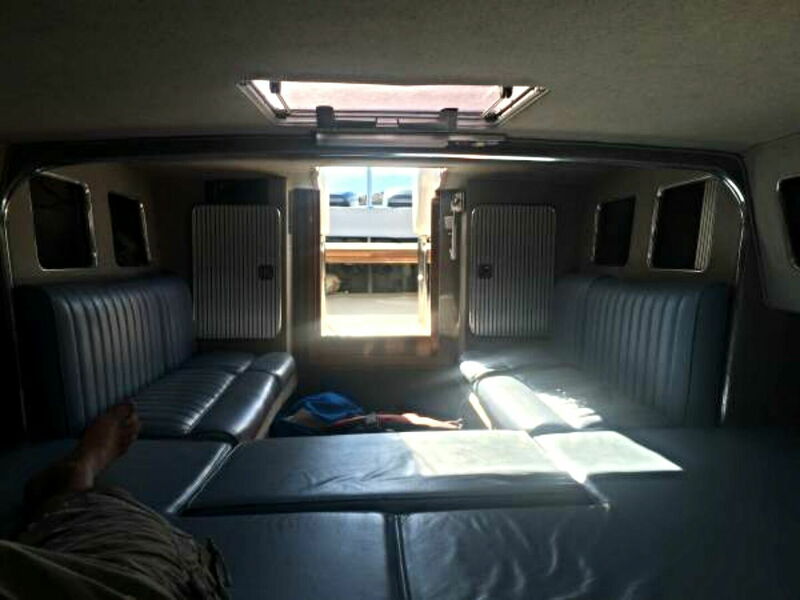 Since the straight vee Scarab 31 has an 8'6" beam it takes twin 300 plus to get in the 70's. To run faster than 60-70 though, in the ocean, i.m.h.o. kills the pleasure even of a poker run for most folks. When I read the Speed On The Water article about seasoned pleasure performance boater Bob Barnhart and why he chose the Mystic M4200 center console it made sense why they're a hit in Florida and many lakes. However I don't want 10-15 folks onboard and I'm old enough to be hooked on sleek vee hulls, so I'm happy like this. Sometimes less is more. (Photo below of Barnhart's Mystic M4200 courtesy of Pete Boden). Padraig and bulletbob like this. Last edited by larslindroth; 02-08-2019 at 05:46 PM. Lavey Craft has built their 2750 NuEra MCOB (28' 6" OAL) with twin Mercury 300xs and that boat runs 91mph not fully dialed in yet. That speed is a "real world" number with a fully loaded boat with anchor and all other day boating supplies as if you'd be using it on any ordinary day and 1/2 tank of fuel (aprox. 50 gal). The dry weight of this boat is 5100lbs. Final speculation on its top speed is 95mph. So build this boat in a closed bow it'll for sure run at least 95mph with the new 300R's and over 100mph with the 400R's. I've heard some talk from Lavey that there might be a closed bow 300R version coming soon so time will tell. larslindroth, bulletbob and Speedracer29 like this. Some of the traditional sports boat enthusiasts have switched to outboard power but many still want big, loud inboards. 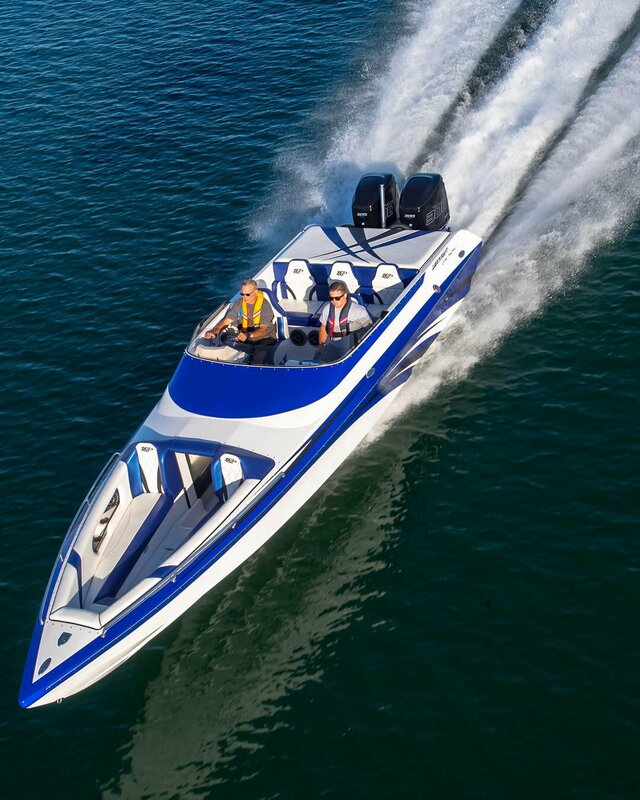 Biggest issue, IMO, is that a closed deck sports boat with twin 400's is 200k and you can entertain 3-4 friends who want to go fast with the wind in their face. Pull up at a bar or on anchor and there's no room to move around onboard, you're standing upright or sitting back in your bolster. 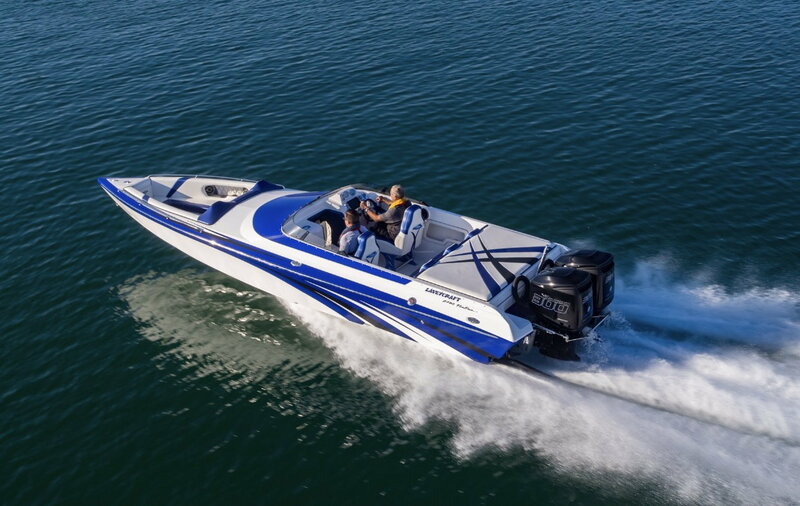 The CC market is so practical, wider beam with entertaining space plus performance is now pretty much on a par with most closed bow sports boats. Boats are too expensive to be purchased on 'whimsy', buyers want to get more for their dollar. There will always be exceptions and there's a very small number of manufacturers out there who can cater for that. The mass market is no longer there. Ing and larslindroth like this. larslindroth and Speedracer29 like this. Concept builds a 30 foot closed bow sport bost. I think Concept called it a '30 Sports Deck'. It's not on their website anymore, don't know if it's still in production. The only one I've ever seen pictured was blue/white with twin 250 xs's. They had a nice video and it looked great, good lines and a big cockpit. Maybe still available...... ? Thanks for the comments...I have actually seen the Saber Marine boat in a couple of the fun runs with West Michigan Offshore and was able to see it up close at the boat show a couple years ago. I guess there are more options out there than I realized. 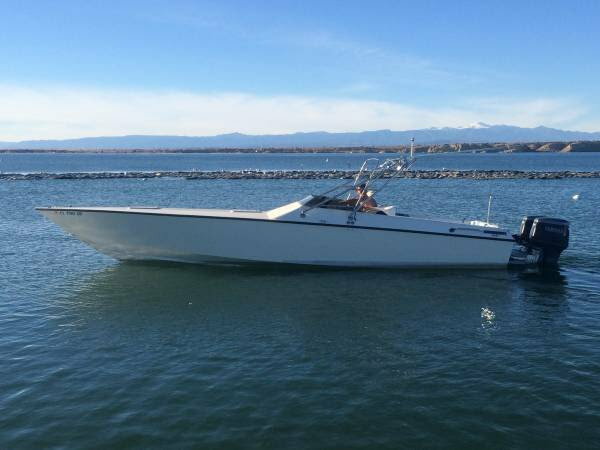 Someone commented above that CC's just offer a simpler style of boating and as I just read on another thread most people who can afford a new boat are getting older (50-60 years) and the idea of working on inboards and walking out on the bow to drop an anchor is just not appealing anymore.